Not a day goes by that we aren’t adding a new food-related word to our vocabulary. This doesn’t come as a surprise considering the way we experience food is ever changing; with the rise of social media and abundance of TV shows around food, our experience of food is more intense than ever. We owe the addition of EVOO to our food vocabulary to celebrity chef Rachael Ray. Her abbreviation for ‘Extra Virgin Olive Oil’ even made its way into Oxford American College Dictionary back in 2007. ‍So yes, EVOO stands for ‘Extra Virgin Olive Oil’ but what makes an olive oil worthy of an Extra Virgin status? And, what makes Colive Oil an Ultra Premium Extra Virgin Olive Oil? What does it take to be labelled EVOO? Let's take it from the top or back to the roots; depends on who you ask. Farming - “Extra Virgin” echelon starts from olive trees and how well they are cared for. There are few critical points in olive (tree) farming that could affect olive oil quality, such as pruning, olive fly (among possible others) and disease prevention and expert agronomic management. These items are fundamental to the quality and taste of the olive oil although they might not result in detectable changes in oleic acid levels to directly affect extra virgin status. These items form a checklist for the best practice in olive tree farming and play an important role in increasing the yield of olives and olive oil without any other non-organic interventions. At Colive, we work closely with the European Union and expert agronomists on the island to ensure all olive farming is done to the best standards. Harvesting - Another factor to take into consideration when it comes to the extra virgin label is the harvesting process. It is critical that farmers only pick the olives from the tree and not the ones on the ground, this makes all the difference in taste. Any olives picked from the ground could leave the bottled olive oil with a rancid smell and musky taste. This is because these olives already start decomposing the moment they hit the bare ground. A net should be put around the trees to prevent olives falling straight to the ground. During harvest, damage to olives and branches should also be taken into account. There are numerous olive picking methods. To name a few: mechanic belts shaking off trees, taller and wider machines (picture an automatic moving car wash type setting picking up olives) and conventional hand picking. We hand pick our olives so as not to damage olives, trees or branches. We use hand-held automatic rakes for those hard to reach areas we can't get to using our hands or a ladder. Taking great care of olives ensures extra virginity, taking care of branches and trees ensures sustainability for our farmers. Transportation - The journey to the mill is of utmost importance for the acidity of the oil. This journey shouldn't take more than 48 hours and fresh olives should be carried in open crates for the journey. Milling - The milling process for extra virgin olive oil is extremely simple and minimal. Extra virgin olive oil is extracted only from olives, the fruits of the olive tree, using solely mechanical means in temperatures below 27 Celsius. This process is known as cold pressing. Olive oil is essentially olive juice. The olives are cleaned of leaves and dirt before being crushed. Colive relies on a modern centrifuge system ( Advance Dual Phase) to get the most oil with only mechanical means. Extra virgin olive oil comes from the first pressing of olives. “Virgin” olive oil is the 2nd round of centrifugation or pressing. Any other oil extracted during the 3rd round or after is labeled as olive oil, or in some cases as 'Lampante'. Lampante literally comes from lamp oil as Roman soldiers used this leftover oil for their lamps. It is not fit for human consumption. Even though the conventional way of stone crushing oil and pressed mats are becoming trendy again, it is not an optimal way of obtaining oil from olives. It causes oxidization of the oil which means acidity, rancidity and a muddy taste. This method also results in low oil yield for farmers. Due to low oil yield from this method, some farmers and certain corporates use boiling water to increase the oil amount and this takes all the nutritional value out of the olive oil. That is why cold pressed became a hot topic in first place. Just a fun fact that makes us look badass at the same time: we use a laser thermometer to measure the temperature in our mill. No treatments, chemicals or anything else - Olives can be washed and the oil can be decanted, centrifuged and filtered but other than that no treatment is allowed including chemical solvents (and heat processes) as these can degrade the oil. This is definitely a no-no, please run away from oils that have light or refined on its label. Storage - The best practice after milling is to keep the oil in steel drums filled with nitrogen to preserve freshness. Nitrogen prevents oxidization and steel containers are optimal as steel is nonreactive with olive oil. Taste - This is a humongous topic, one which we will surely talk about in more detail in a later post. Think of olive oil almost as wine in this regard, in olive oil we have the cultivars and harvest times to play with to create an exceptional olive oil, rather than the whole world of ingredients you can use for wine. There are 500-600 cultivars and only around 50-60 are used primarily for oil. This is due to the efficiency, i.e. profitability of the cultivar when it comes to yielding oil. In our case, a single cultivar delivers a taste explosion and a diverse palette. Because of its extraction method, extra virgin olive oil retains truer olive taste. On this basis, it has a distinct flavor that is described as fruity with a peppery finish. This fruitiness varies slightly depending on the olive cultivar (variety of the olives). The peppery finish serves as an indicator of antioxidants, mainly Oleocanthal. Oleocanthal has similar effects to ibuprofen as it is proven to be anti-inflammatory. Taste is significant for labeling olive oil. There are, especially in Europe, 'taste' tables that are used to measure the quality of the olive oil. The chemical laboratory tests can be misleading while the human pallet is much more reliable. For instance, if a company and this is usually the case with supermarket brands, put hazelnut oil, palm oil or any other chemical oil, or too old of olive oil, a human pallet will be able to spot that and stop it from being labeled as extra virgin olive oil. Unfortunately, these tables are often too few in number and reserved for competitions so they are not enough when it comes to preventing fraudulent practices in the industry. Acidity - Acid here stands for oleic acid. It refers to the free fatty acid, instead of a pH level. We can't really taste oleic acid. Hence, a laboratory test is required to determine the acidity levels. 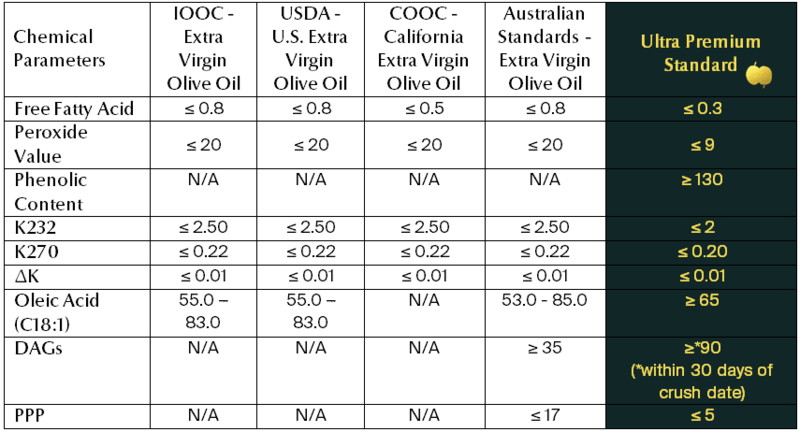 Extra virgin olive oil has a lower level of oleic acid than other olive oil varieties. It contains no more than 0.8% oleic acid. Colive oil's acidity is below 0.3% which puts us in the Ultra Premium Extra Virgin range. This is usually the only required step to acquire the 'extra virgin' label so sadly it is common for manufacturers to forsake all the other steps described above that lead to truly exceptional olive oil. EVOO is regarded as the highest quality olive oil and a staple in Mediterranean diet. It is not an easy task to produce extra virgin olive oil as you need to monitor each and every process with great care (as we say 'from tree to table'). This is why less than 10% of oil in many producing countries are deemed deserving of the label extra virgin. Colive Oil has the 'extra virgin' label but our promise doesn't stop there. We truly believe in controlling the process from “tree to table.” That's how we are able to deliver an exceptional EVOO from our farms to your table.